» What twins age was the hardest for you and how did you get through it? Faint Lines On Ovulation Test: Positive Or Negative? When Do You Start Showing with Twins? What are the Ideal Weights For My Twin Babies During the Pregnancy? What twins age was the hardest for you and how did you get through it? Buy 2 swings, my boys used to love being held to but I couldn’t on my own hold them always. I‘m a new twins mom. They are a little over 2weeks they are 5+6 of children but it’s been 5 yrs that I yearned for a baby and was blessed with 2. They came early and we just came home 4 night now I must be very lucky they eat every 3 hrs and I’m learning their ways – One wants to be held much more. I’m just taking it all in and no more babies for me. I have been crying a lot almost – seems as if I cry more than them. It’s not easy with no family and hubby has to work but God has his plans. 4 months was the worst for me. They had a horrible witching hour that lasted from 8pm-12am and my husband also works nights. It was about 2 months of hell at night. I just learned to live with the fact that one of them is going to cry while I tend to the other and that’s okay. There’s two of them and one of you. Do the best you can and do whatever works best for you. Don’t stress about schedules and bed times and feeding. Just listen to your babies and survive the night. Also on very rare occasions when I got completely overwhelmed I would put them in their cribs and walk away and gain my composure back and come back in with a new attitude. And if all else failed I’d call my husband to come home and help. No real advice. It’s hard having two little ones. I slept in the same room and prepped everything I’d need in the night before bed. I slept when they slept and gave myself slack on everything else. It will get easier but it does not feel like it now. I spent a lot of time on the floor with them at this age. I also used swings and baby carriers (Bjorn, slings, etc.) to have free hands. I use a boppy on my lap for one and hold the other in my arms. So I can sway my legs back and forth making that baby feels held as well. My life became way easier when I stuck to the exact routine each evening. They will become more patient when they know what to expect. Mine are now almost 5 months. I had to feed one every two hours she was 4 pounds at birth. My other twin was 6 pounds. And that was every three hours on the dot. My girls are now 15. I had to go use pillows and blankets to hold and feed them both. You are going to cry, skip meals, and a shower is the only freedom you get. See if a family member or a girlfriend could come over a couple times at night. It gets better it goes so fast. I do not know how I did it all. I was in the same situation when my twins were infants and it was SO hard! Some things have already been said, like prepping everything the night before and sleeping in the same room. I also let them sleep some in their swings when I was having a rough night. It’s so hard doing it alone. I feel like I didn’t sleep for more than an hour at a time for the first year, but really, it went by so fast. And I kinda miss the nighttime snuggles, now that I have 2 super busy toddlers!! I had help the first year, there was always an extra pair of hands when I was ready for a meltdown. Prep as much as you can and do what you can. Everything else will wait, rest. I have 12 week old twins. One of them , if not both of them is always looking to be cuddled and rocked, or just loved on in general. And the other is always looking to eat or at least use me as a pacifier. It’s rough, but I just remind my self that this time really does go by so quickly, my oldest is almost 6 nd I feel like it just goes by too fast. I take it all in, even on the rough nights and I’m ready give up, I remember this is just a little bump in our breast feeding twin morning adventure. We’re also alone 99% of the time, me and the twins and my oldest. But I wouldn’t trade this or them for anything in the world. I was given the advice to enjoy the moment, happiness is a journey, not a destination. I am glad I was given that advice, I enjoyed every moment, as a single parent to twins it was hard at times, until I remembered this time passes so quickly and I so miss those beautiful first few months moments now!… Sleep when you can, the housework will always still be there when you wake up! My twins will be 7 in December- sometimes I can’t clearly remember what it was like when they were newborns through their first year- and sometimes I have a flashback and it’s clear as day- moms of twins: I am not sure there is a day when we don’t mutter to ourselves… we could have all the help in the world and still feel overwhelmed. There are not so exhausting moments and you will get there! I promise. LOVE the hell out of those babies, but seriously having twins is flipping hard as heck! Even if you don’t feel like it YOU ARE A ROCkSTAR!!! My twins will be 7 in December- sometimes i can’t clearly remember what it was like when they were newborns through their first year- and sometimes I have a flash back and it’s clear as day- moms of twins: I am not sure there is a day when we don’t mutter to ourselves… we could have all the help in the world and still feel overwhelmed. There are not so exhausting moments and you will get there! I promise. LOVE the hell out of those babies, but seriously having twins is flipping hard as heck! Even if you don’t feel like it YOU ARE A ROCkSTAR!!! Mine will be 4 months in a couple weeks. I feel like it’s been easier the past few weeks bc they aren’t cluster feeding or quite as needy but I’m nervous about the 4 month sleep regression. Not that there’s much to regress. Mine at 12 weeks and I’m struggling. One of my little girls is colicky though which is making life extremely hard. I also have three other kids to run after. Do you have anything to add? Please add to the suggestions in the comments below and be sure to follow TwinStuff on Facebook. Twinstuff.com is a participant in the Amazon Services LLC Associates Program, an affiliate advertising program designed to provide a means for sites to earn advertising fees by linking to Amazon.com. 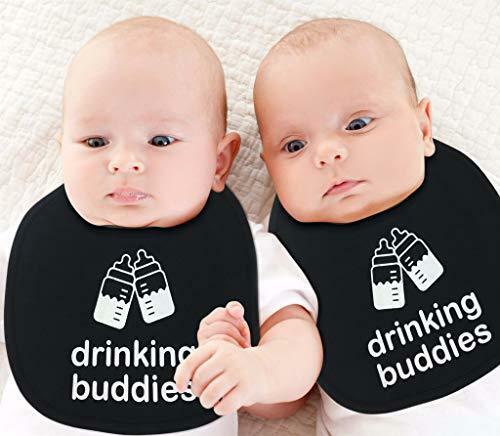 We're Giving Away 1 Twin Bibs Set Each Week! Subscribe to our newsletter to receive updates, twin pregnancy and parenting tips, promotions and discounts, and enter the giveaway. We will confirm your entry in Facebook Messenger. We take your privacy seriously. No spam. See our terms and privacy here. By entering into the giveaway you acknowledge, accept and agree to the TwinStuff Giveaway Official Rules.